I’m not always able to practice what I preach. Last week was one of those weeks. Our practice is experiencing a wild growth spurt and my last patient care day was one for the record books. Not only did we see more patients than we’ve ever seen in a single day, but we had several ambulance transfers and other critical situations. I admit that my charts got out of hand, even with a scribe joining me partway through the day. At least 90 percent of the notes were done before the end of the day and all of them were done within 24 hours, but I had to spend some evening time going through and doing a final review and locking them. Normally our “default” settings are great, but as I was reviewing, I discovered that partway through the day that my “award-winning, cloud-based EHR” began documenting a negative male genitourinary Review of Systems on all patients, even if they were female. Of course they’re not having any problems in their male organs, because they don’t have any. I’m not sure what went haywire, but I had to stop my review process and call in the experts. Our practice’s staff tinkered with it for a while and then contacted the vendor. We still don’t have an answer. Although I can manually correct them, I’d rather not have to go through scores of charts if there’s a quick fix. In my consulting practice, I see a lot of physicians that quickly click through their documents without reviewing them, so this is a great cautionary tale for me to use in the future. In the meantime, I’ve had plenty of diversion with dozens of people emailing me the CMS blog backpedaling on comments about the end of Meaningful Use. At least they made it crystal clear that they’re not eliminating MU and that we’re still stuck with it for the near term. Although it was about as nice of an “oops, we take that back” post as I’ve seen, I take issue with their comments on offices being “wired.” As we all know and as I’ve said time and again, just because technology is present doesn’t mean anyone is using it or that it is useful at all. Most of us in the clinical trenches have used EHRs that have been decent and those that have been soul-suckingly bad. The fact that they’re “wired” has nothing to do with our outcomes. I have several close friends that ran Level 3 Patient-Centered Medical Home practices using only pen, paper, and Excel – and with a level of efficiency and improved outcomes that would put many EHR-based practices to shame. Of course, that level of performance requires not only skilled staff, but individuals who are dedicated, compassionate, and believe in the practices and their missions. It becomes harder to retain that level of staff when they become demoralized by a poor product or a good product with a poor implementation. I’d like to see people who should know better stop using computers as a proxy indicator of whether a practice is moving in the right direction or not. I didn’t make the list for the HIMSS16 Social Media Ambassadors. I shouldn’t be surprised because my use of Twitter and Facebook has been at low tide for months. But I found coverage of the announcement rather funny, in that it says that they are “credentialed by HIMSS to cover the conference.” I didn’t know you could be credentialed for social media – perhaps a license to Tweet? Regardless, I’ll be covering the conference in my usual style, with scheduled strolls through the exhibit hall accompanied by real, live providers and in-the-trenches users of healthcare IT. The reasons I’m not all over social media became clear in another piece, this one featuring tips from the Ambassadors. Medicity’s Brian Ahier @ahier talked about only following “five or six hundred folks” but that he tries to read “every tweet of the people I follow.” There aren’t enough hours in the day for me to be that active in the Twitterverse, even when I multitask while hitting the treadmill. Lately on the treadmill I’ve been working on some required Continuing Medical Education content for my primary specialty certification. I’m six years into a 10-year Maintenance of Certification cycle. Although at least one Board has somewhat put MOC on hold, mine hasn’t. I like to try to get the arduous (and wholly irrelevant) required module out of the way early in the year so I don’t have to sweat it later. In response to my comments last week about there being Clinical Informatics “LLSA” CME hours offered at HIMSS16 (my that was a lot of acronyms in one sentence!) I heard from a couple of readers. One lamented the fact that there are virtually no approved LLSA hours relevant to clinical informatics unless you can attend one of the AMIA conference or HIMSS. It costs thousands of dollars to attend these conferences (most of the registrations are pushing $1,000 on their own) and they’re not always ideal venues for learning. Although I learned a great deal at the AMIA symposium, many of the non-LLSA sessions were more valuable to me as an informaticist than the approved courses. I also learn better when I can focus at home rather than being in a hotel meeting room with hundreds of other people some of whom are having sidebar conversations or moving around and being distractions. Another reader shared some of his correspondence with the American Board of Preventive Medicine, who certifies a good chunk of the Clinical Informatics diplomates. The Board staffer commented that they had planned for AMIA to provide more LLSA-approved CME by this point. My response to that is that it’s irresponsible for a certifying board to rely on a third party to provide credits unless there is a contractual obligation to do so. At least my primary certifying board has its act together and provides adequate content (volume wise – some of it may be irrelevant depending on your practice) on its own. HIMSS also responded to my difficulty in being able to find information on the LLSA sessions. Unfortunately, three staffers sent me a link that didn’t take me anywhere helpful. One did send a PDF with the schedule and instructions which was very helpful. Although many of them overlap, they also mentioned that after the meeting they will be posting the sessions online so that we can access them as “enduring materials.” That will help for those of us who wanted to attend multiple sessions at the same time. There are now over 1,000 of us who are certified in clinical informatics, so for those of you in the latest class of Diplomates, welcome to the CME/LLSA party. 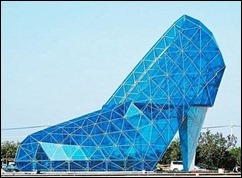 A reader who knows my fondness for shoes shared a link to this church recently completed in Taiwan. It’s supposed to draw more women to attend, but I’d also be on the lookout for fetishists. Do you have your shoes picked out for HIStalkapalooza? Email me. It’s amazing how quick blogs are forgotten when considering “social media.” Your work on this blog alone (regardless of Twitter or other social media should have qualified you as an ambassador. You could always get a press pass. It’s almost the same thing, but actually less work.